Sunset Cottage has been described by people who have visited as quaint, cozy, romantic, bright, peaceful, relaxing. There is one bedroom downstairs and additional sleeping in the loft area. This fully furnished cottage has lots of light with 2 picture windows on the first floor and one on the second facing South and West with great views of the open fields, trees and the Green Mountains. The cottage has a cathedral ceiling with a large loft area that is a TV/Sitting area and can be used as a sleeping area. There is a Vermont Castings gas stove which heats the cottage with additional heat in the bathroom, which has a tub/shower and washer/dryer. Downstairs also is the living room/ kitchen area. The kitchen is complete with a full size refrigerator, gas stove with oven, microwave, coffee pot, etc. Linens are provided. Nearby are country stores, fine dining, churches, libraries, post office, groceries, beverages. and several micro breweries, including the Hillstead Farm Brewery in nearby Greensboro. Cross Country skiing, snow shoeing, skating at the nearby Craftsbury Outdoor Center. Summer Sports: Craftsbury Outdoor Center provides bike rentals. Also the cross country ski trails are used for biking trails. The Center also provides professional sculling lakes and instructions. Snow Mobile: We are located by the trail! Park your trailer and you can ride from Sunset Cottage. Open fields with trees and mountains in the distance. Land line for local calls. No long distance access. I spent 4 nights and had a lovely vacation. We loved staying here. It was clean and quiet. Great place for a family to get away and enjoy the outdoors of Vermont! This cabin was everything we were looking for. In a quaint quiet town, beautiful views, and kind of off the grid AND it had a fireplace . The high ceilings and loft were a awesome touch. Big scenic windows. It was perfect for our girls getaway, but it would also be perfect for a romantic getaway, guys weekend, or snowmobiling because the trail runs right by the yard. WE WILL DEFF BE BACK- maybe even this year! The only negative thing I could say about this cabin is that there is a gas stove and the oven is very very small. My Pork Roast just fit in it ( so if you like to cook take that into consideration) other than that I cant wait to go back!!!! I will deff be spreading the good word ! My husband and I stayed here for 5 days in January and we loved it. Everything was exactly as advertised. 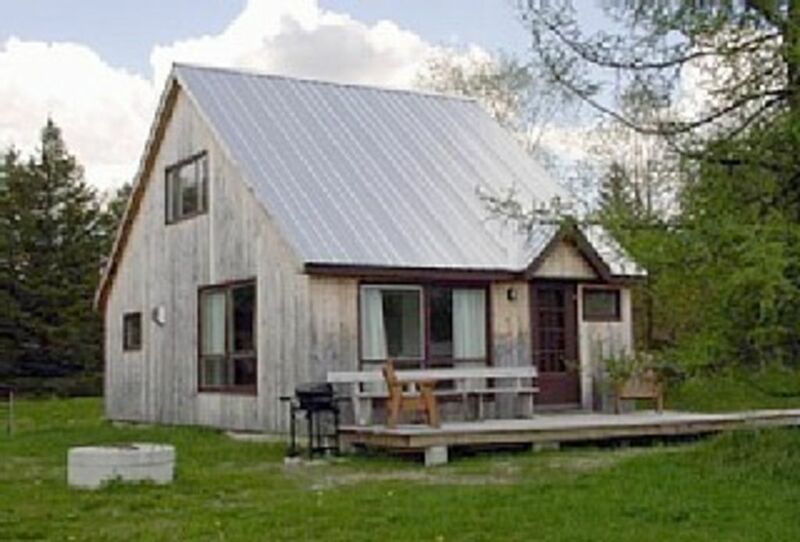 Cabin was warm and well-furnished, kitchen well-equipped, and the bathroom was clean with plenty of hot water. No cell coverage, but we were able to communicate with the outside world via the free Wifi. TV in the upstairs loft area had numerous channels. Extremely peaceful setting and charming artwork on the walls. We grocery shopped before arriving and had most of our meals in the cabin because stores and services in the area are somewhat limited. Extremely convenient to the Craftsbury Outdoor Center for Nordic skiing and only about 40 minutes from Stowe, which is well worth the drive. A good value for the money- we'd stay here again! Enjoy the beauty of the Northeast Kingdom of Vermont, the rural country side, the Green Mountains and the many outdoor activities in any season of the year. Nearby are 5 major skiing & snowboarding areas, Cross Country ski on over 100 km of groomed trails at the Craftsbury Outdoor Center, snowmobile to the door on the VAST trails. In the summer, nearby hiking trails, bird watching, numerous lakes, bike trails, sculling, golf, boating and sailing, etc. Stowe is within an hour. Canada is less than an hour and Montreal is about 2 hours. In nearby Greensboro is the Hillstead Farm Brewery and another 8 micro brewery's are within an hours drive. Golf: Several public and semi-private courses are within an hour of the cottage, including the new championship course at Jay Peak. Ski: Stowe, Smuggler's Notch, Burke and Jay Peak are within an hours drive PLUS nearby Craftsbury Outdoor Center and Highland Lodge for cross country skiing. Biking rental and trails at the Craftsbury Outdoor Center. $800/week; $275/week -end includes tax; One night only is $150.00 Minimum stay is normally 1 week from June 30th to September 1st and the change over day is Saturday, but we do make exceptions. All listed rates include the 9% Vermont Lodging tax. There are no additional charges for cleaning, pets, kids, in-laws, friends, etc.